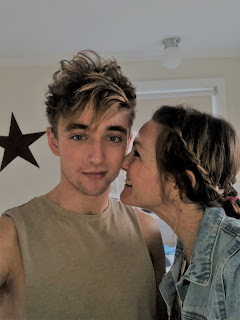 We have had a fun week in our house, Our eldest son Daniel turned 21 on Tuesday, He's a no fuss kind of kid and didn't want a party for his birthday or even go out for dinner so I cooked a nice meal at home and we all celebrated together. It was a fun time. Can't believe one of my children is 21 though. Time goes so fast doesn't it. Speaking of time, Christmas has come and gone and now I'm playing with some different fabrics, I had bought these gorgeous sweetwater fabrics last year and of course they sat folded in the cupboard for months, Then I decided to use them up and make something fun for Valentines day. This fabric is called First Crush and its full of hearts and fun sayings. Perfect for my table runner. Its with my quilter now being quilted so I can't wait to get it back and on my table. I joined a 12 month block swap and each month i get to make a block for someone and at the end of the year we all get 12 blocks back. This is the 1st block I made. Its so pretty. 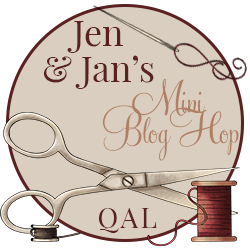 I'm in another sewing swap with some other dear friends. What we did instead of sending gifts to each other for our birthdays, we decided to make quilt blocks so at the end of the year we will all have blocks to make a quilt, we chose a pattern called In the Neighbourhood ( I think ) there is 8 of us in the group. So I was given 2 different blocks to make. I need to make them 8 times as i make for myself as well, so here are my 2. Arent they cute. There are 2 birthdays in February so I have been busy getting my blocks sewn. So thats what has been keeping me busy throughout January. What have you been working on? Your table runner is lovely. Your second swap is a great idea! 21! Really?! Where on earth did that time go? Have we really been blogging that long? That's a lovely Sweetwater quilt. Can't wait to see it quilted. Your swap blocks are so sweet and such a nice idea. I love my swap quilt to bits. You are going to finish with a lovely set of very special quilts. Since it's still 4,000 degrees here in Sydney, I'm thinking of moving to Tassie from November to May each year. So much loveliness there Leanne. Happy Birthday to your dear son. What fun projects! 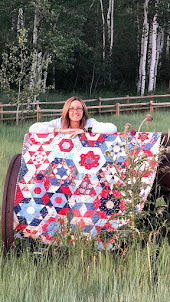 I love red, white and black, but have never made a quilt like that. The exchange blocks look like a great project! It's amazing how time passes - sometimes it seems slow, but looking back, it seems fast. Now, my grandchildren are growing up too fast!